The direct tailpipe emissions impact of congestion pricing is outweighed by its force multiplier effect. Will congestion pricing deter climate change? I ponder that a lot, both as an ordinary citizen and as founder-director of the Carbon Tax Center, which promotes robust carbon taxes as a central policy for eliminating fossil fuels. My answer is: Yes — though perhaps not in the ways you might think. Official city data peg total NYC emissions of CO2 at 50 million metric tons a year, of which 15 million are from “on-road transportation” (motor vehicles). Move NY will shave just 2 percent from the total and 6 percent from the transportation part — reductions somewhere between “modest” and “helpful,” and well short of game-changing. That outcome neither surprises nor disturbs me. Congestion pricing, whether Move NY’s version or some other form, purposely addresses only one segment of New York City car and truck journeys — those that involve the Manhattan central business district. And rather than doing away with those trips, it seeks to leave most of them intact to be tolled for revenue — “billing, not banning driving,” you could say. Because of this, Move NY will diminish citywide motor vehicle traffic by around 4 percent. That’s commensurate with the subset of city and area car trips that it targets — those that, as a group, impose the greatest congestion costs, have the most robust transit alternatives, and are so valuable to their takers that most will continue to be made despite the toll, thus creating a hearty new revenue stream for transit. What congestion pricing does fabulously well, then, isn’t to stop New Yorkers from driving but to make it easier for everyone to get around. I estimate the net time savings that residents and commuters will gain from the Move NY plan at 485,000 hours per day. Not only will traveling in and near the CBD be faster, it’ll be more reliable, less stressful, safer and healthier. An estimated 120,000 more people will come to the Manhattan core each day, as increased transit use, carpooling, cycling and walking more than offset the contraction in car trips from the new tolls. The direct tailpipe emissions impact of congestion pricing, visualized here, is outweighed by its indirect force multiplier effect. In short, congestion charging will help New York function better. And therein lies its true climate payoff — in the thousands of households, jobs, and activities that will locate or remain in the city, rather than fleeing our crushing gridlock and dysfunctional subways for the new exurban ring or the Sunbelt or even the inner suburbs, which aren’t “inherently green” like NYC and have carbon footprints many times larger than New Yorkers. I haven’t tried to quantify that effect (surprise! ), but the effect has got to be large. Consider that New York’s per capita CO2 emissions are two-thirds below the national average, according to city figures (6.1 metric tons per year vs. 19, or a difference of nearly 13 tons). If we credit each of those 120,000 additional travelers to the CBD with a CO2 saving of 13 tons compared to living or working in Anytown, USA, we arrive at an annual emission savings of over 1.5 million metric tons — far exceeding the 950,000-ton direct reduction from Move NY’s fewer and cleaner tailpipes. While that calculation is strictly illustrative, it shows the upside. But the force multiplier from congestion pricing is bigger still. New York may not be the world’s biggest city, our subway system is no longer the largest, and we’re not the safest city despite our precipitous drops in violent crime. But our city remains the most iconic, the one that “inspires better than any other city in the world,” as meteorologist and Grist writer Eric Holthaus tweeted this week. “What we need right now, more than anything,” Holthaus added, “is inspiration.” We need to show the citizens and leaders of the hundreds of other great cities around the globe how to turn congestion into revenues with which to build a city that’s sustainable, low-carbon, and humane. Glad to know that, Jon. I’ll check it out. Y’all sure were on the cutting edge back then, in more ways than one! This article is based on dubious assumptions of inherent superiority of NYC’s carbon footprint over other places; and thus, the positive good of adding even more people to NYC. These assumptions don’t hold up under scrutiny. * First of all, the climate… NYC is cold and spends a lot of CO2 just heating buildings. LA region has the lowest carbon footprint of major American metro regions largely because they don’t have to heat or cool their homes. Depending on the location, somewhere in the sunbelt might not be such a bad idea. * Then there’s the size… NYC covers a LOT of area, resulting in LONG travel times. Smaller cities frequently require shorter distances, even if they are also lower density. * Then there’s NYC compared to its peers worldwide: NYC is one of the most high-carbon mega-cities (10-million or above) worldwide. Where is the data on how much easier it would be to drive 12+ miles to the gym daily? For purely selfish reasons I’d rather the population of NYC decrease instead of increase. One reason is a decrease would bring ridiculous housing prices back down to Earth. A second reason is less people equals less congestion, both in the subways and on the streets. That said, I’m not sure if the climate here is a big factor. Large office buildings don’t actually need to be heated until the temperature drops under about 40°F due to the heat load from people and equipment. A lot of residences, particularly apartment buildings, don’t need active heating other than for the coldest three or four months of the year. In the Sunbelt you need A/C 9 to 12 months of the year, depending upon where you are. Moreover, these places are only going to get warmer. Ideally, a place to encourage growth would be somewhere with temperatures mostly in the 50s or 60s all year round. At those outdoor temperatures most buildings hold a comfortable inside temperature without heating or cooling. Not sure too many places like that exist in the US. I wonder how many southern California coast buildings are constantly climate controlled regardless of outside temperatures. I wonder how the water infrastructure impacts? People in the sunbelt blast the A/C too, the southern California coast in an exception. And places in the sunbelt can get cold enough for heating in the winter. And people outside NYC drive for almost all trips. You also have a single building cooling or heating versus multiple units, which takes less energy per unit than a single detached home. NYC might be big, but I wouldn’t really use that as a good comparison because the borders are arbitrary. You would have to compare equivalent sized areas geographically. Like the impact of an average city block or square mile versus city block or square mile. If LA doesn’t have to heat or cool their homes, there’s something very wrong with their carbon footprint elsewhere because it’s a hair below ours (Appendix A). And that’s comparing metro areas circa 2008, so NYC proper might be considerably better still. Besides that, it’s hard to see how they would NOT have to at least cool their homes with summer temperatures there regularly breaking 90. Maybe they save on heating, but those 80 or 90 or 100 degree days, which happen even in late fall or early spring, make up for it. The World Bank as of 2011 has NYC at 7.9 GHG per capita well ahead of LA at 13 GHG per capita for its CO2 footprint. We live in smaller apartments often surrounded by others keeping heating and cooling costs relatively low, and travel shorter distances by more efficient means. I was in LA a few months ago and I just couldn’t believe how unfriendly the city was towards walking and bicycling. People drive everywhere in that “city.” They also drive really long distances. Yeah. Either way, it’s a metro-to-metro comparison, not a city-to-city comparison. It’s probable that our outer suburbs are considerably less energy efficient than theirs. IIRC the NYC metro area is actually less densely populated than LA’s. I have a friend who lived in LA until 1994. He said the air was so awful he was having severe chest pains while trying to ride. I’ve heard the same about other sunbelt cities like Houston and Dallas. Between the heat and air pollution it’s actually hazardous to your health to be outside much of the year. I would be more worried about getting killed by a driver while biking. No respect for bicyclists in LA from what I saw. One thing I will give them though is that drivers really do yield to pedestrians in crosswalks there, but there’s so few pedestrians in general when compared to NYC. Places like the Hub, Fordham Road, 125th St, Jamaica and Flushing, any NYC commercial strip really are much busier than Downtown LA and other business districts in that city/county. And the point of the article is that congestion pricing will allow more people and activity within the densest parts of NYC that are the most energy efficient. Yeah, it’s kind of funny how some so-called CBDs in other “cities” more resemble the suburbs or eastern Queens than they do the denser parts of NYC. LA has an average of 10 days per year over 90 degrees. NYC has an average of 11 days per year over 90 degrees. LA had a massive heat wave this fall, but that’s not typical. Climate change may be altering the stats, but it’s not like LA will have Miami’s hot humid climate in our lifetime. LA’s suburbs to the east get hotter, for sure, but the city proper usually has comfortable weather, more so than anywhere else in the country. The beach areas are often foggy but very rarely hot. The closer you get to the beach on the West Coast the more temperate the climate. It’s the narrow strip of Coastal California– really extending from San Diego to San Francisco– that has the least heating and cooling cost in the country. Inland areas of California have more hot and cold requiring more use of both heat and AC. Their transpo culture is stunningly boneheaded, but they seem to at least be working on answers besides further ingraining car culture. ~45 miles of light rail alone since 2000, plus heavy rail and a few bus projects. That’s not even counting several projects under construction and due to open in the next few years. The only rail new NYC has put into operation in that time is a bit of the SAS and a paltry expansion of the 7 Train, and only one of those projects really meets a tangible transportation need. It depends on how close one is to the coast. Within 3-5 miles of the coast zero need for A/C and really nil need for heating. It’s only 20 miles inland where the need for A/C in august/july becomes necessary. Note that until the late 1940s, most homes in SoCal were built without heating. You are looking just at the city limits, not the entire metro region. That is disingenuous, since the five boroughs are not an economically independent unit. You have to consider the metropolitan region as a whole. When you do that, you see that Honolulu has the lowest per capita carbon footprint, with LA number 2. Both of them have something in common: little need for heating or A/C. Angelenos do drive more than New Yorkers; but that is more than compensated for by lower CO2 footprint heating and cooling their homes. I agree. But we’re talking here about CO2 footprints, not friendly streets. That’s right. LA spends more energy on transportation and less on heating/cooling than the NYC region. They don’t have to spend as much heating and cooling as New Yorkers. In New York, we just had 0-degree weather; a nominal 70-degree difference that must be maintained between outside and inside. If LA has a 100-degree day, that’s still only a 30-degree difference that must be maintained. Look at your heating bills vs. A/C bills. I lived in a home in CT where I spent $500 on heating oil in JUST ONE MONTH. Compare to the $50/mo I spent on A/C in Boston (a much more efficient home), during May-Sep. Compared to heating, A/C is just not the evil villain it is made out to be. It’s a real stretch. You really don’t know where these new New Yorkers will settle. A/C is generally cheaper to run, and lower CO2 footprint, than heat in the Northeast. I once spent $500 on heating oil in just one month. Others with larger houses spent $1500. Geothermal heat pumps negate much of the difference between heating and cooling. In the winter you’re stepping up from a ground temp of about 50°F to room temp even if the indoor-outdoor temperature difference is over 70 degrees. That’s maybe 3 or 4 times more efficient than straight resistance heating. Incidentally, if there’s only one or two people in the house, it’s cheaper to put the oil heat thermostat at a very low setting, like 50°, and just heat whatever rooms you’re in with electric heaters. A geothermal split system just magnifies that efficiency further. We also spent close to $1000 for heating oil for the last two months, although part of that is also for hot water (that runs ~$100 a month). Oil is getting way to expensive to use for heat these days, which is why I’m going to get serious about installing a geothermal heating/cooling/hot water system ASAP. I’ll say that with a normal winter heating oil averages $300 a month for the heating part (as I mentioned in my other post hot water adds about $100 a month all year round). In the summers it’s not uncommon for our electric bills to be $200 to $300 a month more than they are in months where we’re not heating or cooling. Also worth a mention is the blower on the boiler uses about 700 watts when the boiler is in operation. The hot water pump for the heating system uses another 250 watts. That’s enough to run one space heater. While on this subject also consider there’s a big difference between the way we heat and cool homes in this country. We usually have a thermostat which keeps the entire house at some fixed temperature. When we use A/C, we just turn it on in whatever rooms we’re in. If we did the same with heating it doubtless would be much less. Of course, you need a minimal amount of heating to keep your water pipes from freezing, but 40°F is adequate for that in unoccupied rooms. There’s a legitimate debate about NYC parochialism in the comments and with all due respect to the eminent Mr. Komanoff there is one more benefit that he could have mentioned here: If NYC with all of its media attention successfully implements congestion pricing then one would expect that at least some other cities would follow suit. And even if those cities may be sprawl cities now, congestion pricing is an important policy move for them to make the move to sprawl less. Let the competition for least sprawl begin as soon as possible! Perhaps you missed my penultimate sentence? Or maybe it didn’t say what I intended it to say? It’s also worth mentioning that density isn’t the be all and end all of sustainability. As a good example, when structures get much over maybe 3 or 4 stories you generally require elevators which use quite a bit of energy. You can have sustainable off-grid living in the middle of nowhere. I think one big key here is lessening the need for transportation by telecommuting no matter what the density is. You might also take active steps to limit discretionary travel as well. Any kind of transportation other than walking or cycling is a major user of energy. Of course, there are other issues with sprawl, like the destruction of natural habitats. That said, there’s probably a happy median between Manhattan and McMansions on 1+ acres. Just moving away from automobiles for transportation means a lot of former street space can be repurposed, allowing denser settlement without people having less personal space. I fully support congestion pricing, but am I missing something in the analysis? If a resident in Anytown, USA travels to the Manhattan core thanks to the benefits of congestion pricing, how does that result in CO2 emissions benefits? As long as the person continues to live in Anytown, I don’t understand why there would be emissions reductions equal to the difference between NYC and Anytown emissions? And, if the resident of Anytown is going to the Manhattan core instead of staying home, aren’t there incremental emissions related to the trip to Manhattan? I think the point is not about visiting, but about moving: if someone moves from Anytown to NYC because NYC can hold more people thanks to congestion pricing, there is a reduction in emissions. The point in the blog is that reductions would result from travel to the Manhattan core, not from someone moving there. I understand how moving to the Manhattan core could reduce emissions, but that assumes there are vacant housing units. 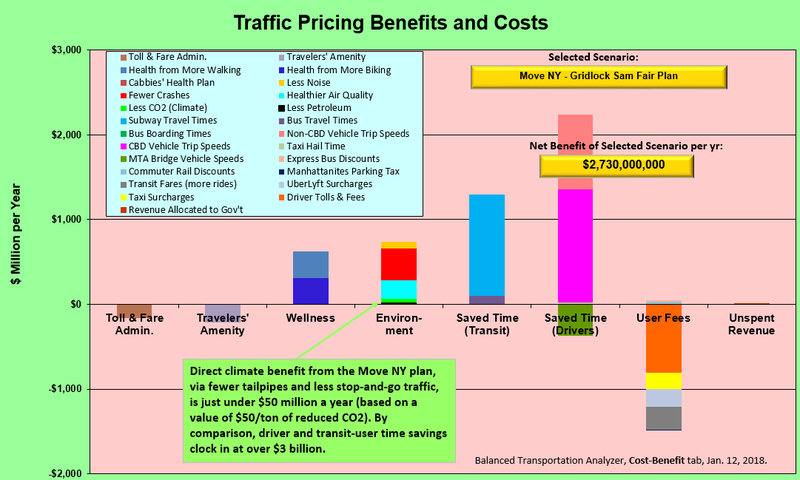 Congestion pricing could produce major benefits, but it would not make it possible for NYC to hold more people, Would the emissions reductions attributable to someone moving to NYC have to be offset by the emissions increase attributable to someone moving out? Note the “enabling many more people to live [in NYC]”. I’d say that summarizes the point of the article. You can certainly argue that the article is wrong because of housing availability, which is not addressed explicitly by the article, but nevertheless, that’s the point it’s making! Our expert debunks one of the Nobel laureate's misperceptions about carbon taxation.